Rural Healthcare Advocacy Project Director Russell Rensburg presents the Protecting Rural Healthcare in Times of Economic Crisis report. Rural communities in South Africa, which make up 40% of the population, face immense difficulties in accessing adequate healthcare, according to a report titled Protecting Rural Healthcare in Times of Economic Crisis. The report was launched on Tuesday by the Rural Healthcare Advocacy Project (RHAP) in Braamfontein, Johannesburg. 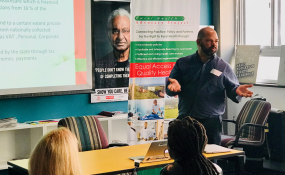 "We have a constitution which states that all people have a right to healthcare, yet rural communities continue to face difficulties accessing healthcare," said RHAP Director Russell Rensburg. Health expenditure per person in real terms has been shrinking since 2012, according to the report. Austerity measures have been imposed as health needs grow and government revenue declines the report says. Yet the cost of human resources and medical products has risen. The report says: "Rural citizens have been discriminated against. They have not received an equitable share of public health financing as historically the emphasis has been on urban areas and hospitals, as opposed to rural communities and primary healthcare." The report found that government spending on healthcare has increased but it "has been insufficient to meet healthcare service delivery costs." One effect of the budgetary constraints is the failure to fill vacant posts in the public health sector. The report says government needs to reprioritise its budget - not only to allocate more towards health, but to focus on the "worst off" and the most vulnerable populations. "Total health spending in South Africa accounts for 8.8% of GDP, yet less than half of that spending takes place in the public sector. More than 4.6% of GDP is spent on healthcare within the private sector ... re-directing money from private to public spending is an obvious area to look at as part of urgent reform," says the report. Technical advisor for RHAP Marije Versteeg-Mojanang said the lack of specialists in rural communities means that people suffering with terminal illnesses such as cancer have to travel long distances for treatment. Even though there are difficulties providing healthcare to rural communities, there needs to be "at least reasonable dignified access", said Versteeg-Mojanang. More community health care workers in rural areas are crucial. "If we had enough community healthcare workers in rural communities we would not be having some of the problems we are facing, particularly immunisation and early detection of treatable diseases," she said. "It's high time that community healthcare worker services are professionalised. Proper training should be provided and provisions should be made to promote them," said Rensburg. The report also points out that healthcare services are dependent on the efficiency of numerous other departments: "It is not only the responsibility of the Department of Health to get healthcare to rural area but by authorities responsible for road construction, building of hospitals and clinics."